One of the best ways to improve the beauty and functionality of your property’s exterior is to construct a custom designed fence around your yard. A decorative fence will enhance the curb appeal of your residence. At the same time, it will add an extra layer of enjoyment and security to how you use your property. At Allpro Contracting, our exterior remodeling contractors specialize in building and installing fences in Southwest Chicago. 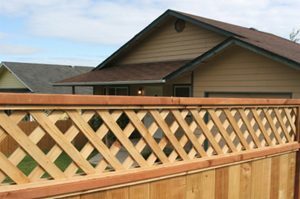 Whether you want a wood privacy fence, metal fencing, or some other type material for your new fence, our remodeling experts will ensure top quality results. For the last six decades, Southwest Chicago residents and businesses have trusted our professionals with all their exterior remodeling needs. Throughout this time period, we have maintained one simple goal. In every service that we provide, our team places customer satisfaction as our highest priority. When you hire us to construct your fence, our Southwest Chicago remodeling contractors will bring this dedication to excellence to task for you. Call Allpro Contracting today if you are interested in constructing a new fence around your Southwest Chicago home. Our polite and professional staff would be happy to take your call and to assist you in any way that we can. Our knowledgeable experts can answer any of your questions. We can schedule your appointment today. A well-constructed privacy fence is a thing of beauty. At the same time, it allows you and your family to take full advantage of your yard without having to worry about the encroachment of neighbors and those passing by. If your old fence is dilapidated and needs to be replaced, you should call our professionals for help. Our Southwest Chicago exterior remodeling contractors can help you with this entire effort. We have constructed countless privacy fences for local residents. When you hire us for the task, you can rest assured knowing that this project will be handled in the most exceptional fashion. You and your family are guaranteed to be pleased with the results. If you are interested in making a truly unique change to your Southwest Chicago home, you should consider constructing a decorative fence. Our exterior remodeling contractors work with a wide range of amazing materials including aluminum, vinyl, wood, and more. Our professionals can provide you with a wide range of sample materials so that you can choose the decorative fence that compliments your architecture and achieves all of your aesthetic goals. Your home or business will look absolutely amazing after our efforts. You and your family are guaranteed to be pleased with your decorative fence for years to come. If you would like an estimate for fence construction in Southwest Chicago, please call 708-658-3500 or complete our online request form.